President John Mahama has launched the Ghana import, export and transit process manual which will provide a legal framework for the smooth progress of the Ghana National Single Window and make it conform to international standards and practices. He said the national single window was designed to significantly strengthen the trade and the economic performance of the economy. 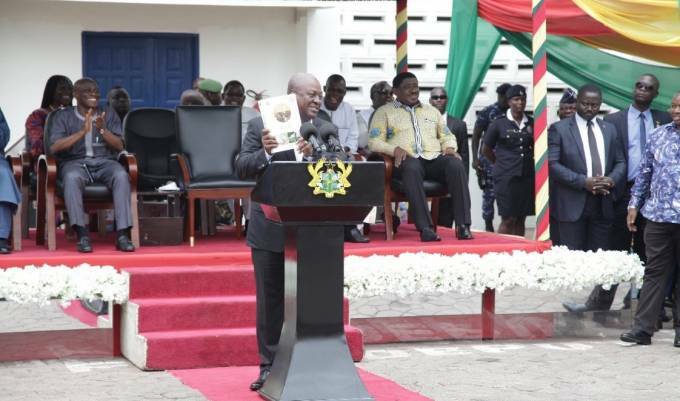 The President said trade facilitation in Ghana has been enhanced with 57% increase in the volume of goods processed in the customs technical services bureau. He said revenue collection has improved and has become more efficient with 14.8 percent increase in collections over the period. He said over the next five years, the country should achieve an overall reduction in administrative time by 50% and the cost of trading internationally by 25%. He noted steps taken towards trade facilitation in the country have made Ghana a favorable destination for foreign investment. “We will remain a favorable investment destination in Africa and we will continue to attract massive foreign direct investments,” he said optimistically. He said Ghana has moved up five places in the Africa competitive skill which looks among other places at how open economies are to international trade, adding that the national single window initiative is one of the key component that has helped Ghana to achieve this improvement. “The Ghana Single Window is a particularly positive development for our international trade operation and helping us to achieve our vision of a diversify economy, effective revenue collection and deploying a transparent process to support our approach to good governance policies,” he said. The Minister of Finance, Seth Terkper said the national single window has led to an increase in revenue generation and customs trade procedures. The ministry of finance, according to him has created a separate division for revenue policy within government fiscal management. The Commissioner General of the Ghana Revenue Authority, said the introduction of the Pre Arrival Assessment Reporting System (PAARS) has led to the reduction of cost of doing business in Ghana. “The transfer from the DIC’s of the core customs functions of valuation, classification and risk management prior to GRA, custom division deserves celebration for more than one reason. In the first place it has provided opportunity for the adoption for the superior technologies and approach to performances of these functions,” he noted. The deputy Minister of Trade and Industry, Mohammed Murtala said single window has reduced the cost of doing business not less than 25%. He said the national single window has also reduced corruption to some extent. “Sadly and unfortunately, we live in the part of the world where time is not part of cost of production and if you calculate the amount of time that importers and exporters will spend at the port and begin to quantify in monitoring value, you would realize that single window has helped to reduce cost less than 25%,” he said. The President of the Association of Ghana Industries, James Asare Adjei, said the Association had so far been impressed with the implementation of the single window project on account of the reduction of the time of doing business. He said the Association would be expecting a competitive and fair trade facilities for the indigenous Ghanaian businesses to enhance their growth and development in coming days. The President of the Ghana Institute of Freight Forwarders (GIFF), Kwabena Ofosu-Appiah said the National single window project has brought immense relief to players in the clearance chain. HOW MUCH CAN THE NDC PRESIDENTIAL ELECTION RESULTS PREDICT THE 2020 ELECTION?